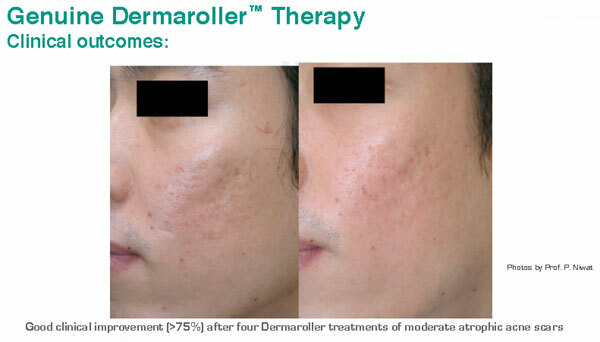 The Dermaroller™ device is marketed for the treatment of Medical Skin Needling or Collagen Induction Therapy. It is aimed at stimulating the body’s own collagen production to reduce the appearance of fine lines and wrinkles, stretch marks, skin laxity and scarring by introducing a series of fine, sharp needles into the skin. The needles are attached to a single use, sterile roller which is moved over the surface of the skin to create many microscopic channels or columns at various depths of penetration. This “damage” to the dermis encourages the body to produce more new collagen and elastin which generate new skin cells to literally “repair” itself, thus the skin becomes thicker, plumper and more youthful. Dermaroller™ originates from Germany and was first commercialised in 2005, after initial prototype testing started in 1999. 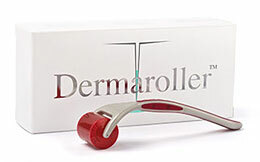 It is distributed in the UK by Aestheticare Ltd. Due to the increase in copycat and inferior products using the ‘dermaroller’ name within their description and product names, the original Dermaroller™ has been forced to now refer to itself as the Genuine Dermaroller™. It was the first such device to be given a European CE mark classification as a medical device. The Dermaroller™ devices are each equipped with 192 needles mounted on a 20mm wide roller which has 8 needles in each horizontal row, and comes in both medical and cosmetic use models. The recommended method of operating the Dermaroller™ to achieve the optimal result over a specific area is by a pattern of roller movements which creates an overlap and can produce over 300 microscopic columns per cm2. The Cosmetic, C8 model has needles of 0.13mm in length, with a penetration diameter of 0.07mm. As these needle tips can barely be seen with the naked eye, they only penetrate into the epidermis and cannot reach the dermis where collagen formation occurs, thus are aimed at assisting the infiltration of active ingredients within skincare products for the home user. The retail price for the C8 model is approximately £75.00. The Medical models, CIT8 and MF8 are for use by trained professionals only. The CIT8 has a needle length of 0.5mm and the MF8 has 1.5mm, which depending upon the applied pressure can penetrate the skin from 0.1 – 1.3mm deep, with a needle diameter of up to 0.25mm. Both of these models are designed to reach deep enough into the dermis to induce new collagen formation. For smaller areas of the face, such as above the upper lip, a baby brother to the MF8 model (MS4 -1.5mm) is available which has only 96 needles mounted on a 10mm wide roller with 4 needles per row. A further medical model, the CIT10, is due for future launch which has a needle length of 1mm. Images provided courtesy of Aestheticare Ltd.
A single, in-clinic treatment with Genuine Dermaroller™ is likely to cost from £200 - £350, depending on the practitioner, including post treatment skincare. Further sessions, should they be required will be less and are often combined at a discount in a programme. Click for ALL Genuine Dermaroller™ clinics in the UK & Ireland registered and verified by Consulting Room.